Waiting to Find Out Baby’s Gender? The question I get most often these days is, “What are you having? A boy or a girl?” When I respond telling them we are waiting until delivery day to find out, I get a few different different responses. The last one cracks me up, especially when it comes from people who don’t know me very well. I am your stereotypical type-A, first-born, recovering control-freak. (Hallelujah for the recovering part. It’s been a journey, but God has brought me a loooong way.) All that to say, yes, it’s possible to be a planner and wait to find out gender. If you are so inclined to wait to find out gender and this is your first time to do it, I thought I’d share a little of our experience with you. Remind, remind, remind. You must remind the ultrasound tech and your doctor that you do not want to know the gender. I have had a couple late ultrasounds the past two weeks because my amniotic fluid is on the lower end of the safe range. At my appointment last Friday, I had a different ultrasound tech than my usual. She had the wand on my tummy and said, “Now, do you know what you’re having?” In a loud, shrilly voice I said, “No! No! We don’t! I’m so glad you asked! We don’t want to know!” Woosh…that was close. Every time, just kindly remind them that you don’t know want to know what you’re having. Nursery. But how do I design and prepare a nursery? The answer for us was to go gender-neutral and then add a few girly things after our babies were born. We would have done this regardless because Matt and I are both frugal, and I didn’t want to have to buy all new bedding and nursery decor a second time if we had a different gender down the road. Our nursery has stayed virtually the same through all three babies except the letter above the crib and a few little accessories. We used a lot of aqua, yellows and greens, and a fun, colorful rug from Anthropologie. I’ve known other people who have waited until after baby came to finish the nursery, and some bedding places let you design two different collections and your ultrasound tech can send them the gender so they have it ready for you when baby is born. Clothes. This one is a little harder because I’m not a big fan of most gender-neutral clothes. But we have a few newborn onesies, gowns and footies that are gender-neutral to get us through the first couple weeks. We ended up not even needing them because when we got home from the hospital with Lydia and opened up the nursery closet an explosion of pink poured out. Some grandmothers and aunts had been hard at work. Then, with Charlotte, Mom just took all the girl newborn and 0-3 month stuff out and washed it all while we were still at the hospital. The truth is babies go through those early sizes so quickly that you don’t need just a ton of them. If you get plain white footies and onesies, you can have them monogrammed after baby comes too. Coming Home Outfit. With Lydia, we had two outfits, one for boy and one for girl, and my mother-in-law simply returned the boy outfit after she was born. (With the tags still on and everything.) With Charlotte, I found a little white footie that could go for boy or girl and a knit pumpkin hat since we called her Pumpkin during the pregnancy. 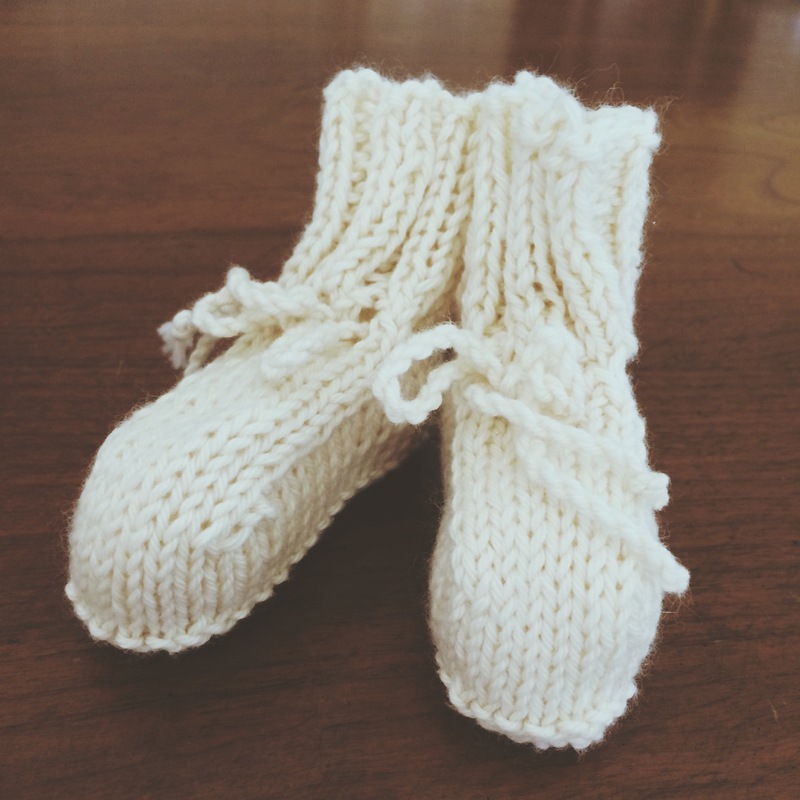 With this baby, I found a little cream cable knit outfit for baby to wear home. My friend Heather is not finding out this time, and she is taking her coming home outfit and her son Hampton’s coming home outfit to the hospital. I thought that was so precious. Name. We pick out a boy and girl name each time. Our names have changed from one pregnancy to another, and I always say that I reserve the right to change the child’s name at the last minute. Not being able to get anything monogrammed beforehand is a little hard for this Mississippi girl, but we’ve made up for it after the fact. And it’s so fun to say your child’s name for the first time as you see that little red, screaming face make his or her grand entrance. Baby Stuff. We went all gender-neutral with stroller, swing, baby bathtub, towels, Boppy covers, etc. I wanted to be able to reuse everything no matter what gender we had down the road, so this just made sense for us. You can always add in gender-specific items later if you want. For example, our car seat was neutral, but we had a pink and brown car seat canopy that we used for the cold months. So, yes, there are a few things that are a little more difficult to “plan” for if you don’t find out gender, but for Matt and me it was totally worth it. After a scary delivery with Lydia, hearing our doctor say, “It’s a girl!” was the best moment Matt and I could have imagined. And I’ll never forget Matt squeezing my hand tight as he got to announce to the world, “It’s a girl!” when Charlotte took her first breath. All the planning in the world can’t prepare you for the moment you meet your child for the first time. If you’re thinking you might like to wait to find out gender, we say go for it! And if you decide to find out beforehand, please invite us to your gender reveal. Because we really, really like cake–both pink and blue!